Peruvian chicken, aka, or simply "charcoal chicken," has crisp, flavorful, smoke-kissed skin, juicy flesh and an herbaceous, positively addictive green sauce that accompanies it. Peruvian chicken, aka pollo a la brasa, or simply "charcoal chicken," has crisp, flavorful, smoke-kissed skin, juicy flesh and an herbaceous, positively addictive green sauce that accompanies it. Peru has a Swiss national to thank for its most popular chicken dish, which has its own day on the Peruvian calendar (July 21). In the 1950s, Swiss expat-turned-chicken-farmer Roger Schuler was on the verge of losing everything. In desperation, he set up four tables in his farm home and advertised "all you can eat" spit-roasted chicken for only 5 soles (about $1.95) to local workers. Today, La Granja Azul (The Blue Farm) seats 450 patrons at its hacienda on the outskirts of Lima; chicken--still "all-you-can-eat"--is served with thick-cut fries and a green salad. And the price is 55 soles ($16.25). When Peruvians emigrated to North America in the 1970s and 1980s, they brought this culinary treasure with them. If you have eaten Peruvian chicken at a pollería in Lima, you have likely noticed differences between the indigenous and Anglicized versions. The former is usually a smaller, younger bird, and while not aggressively seasoned, it often features two ingredients that are not well-known in the U.S.: ají amarillo paste, a yellow chile pepper paste with a fruity taste and mild to medium spice; and huacatay (wah-kah-tay) paste, a distinctive-tasting herb compote also known as black mint. The chicken was traditionally spit-roasted over charcoal from the now-endangered algarrobo tree. Slather the wet rub on the outside of the bird, then gently lift the skin covering the breasts and thighs and use your fingers (or a wooden spoon) to season the flesh. If you have extra rub, put it in the cavity. If desired, let the chicken marinate in the rub for up to 8 hours, covered and refrigerated. To prevent the bird from flopping on the spit, either truss or tuck the wings behind the back and tie the legs together with butcher's string before grilling. No rotisserie? No worries. The chicken can be grilled indirectly on your grill or even beer can chicken-style. To emulate Peruvian algarrobo charcoal, blend mesquite and mild-flavored smoking wood chips (such as apple or oak). At the most, you'll need 2 cups. Soak in water or beer for 1 hour, then drain before using. 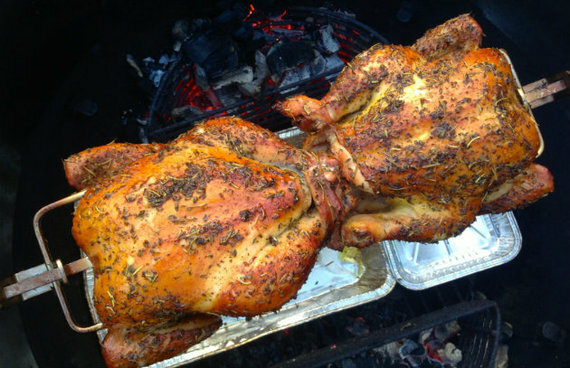 For five more tips and the recipe for Peruvian spit-roasted chicken, visit BarbecueBible.com.